New drama series written by Eva O'Connor and Hildegard Ryan to be released on BBC Three in October. Based on Eva O'Connor's and Hildegard Ryan’s play, ‘Overshadowed’ tells the story of a young girl called Imogene (Imo) whose life spirals out of control when she meets the monster of anorexia personified. The play premiered at the Tiger Dublin Fringe in 2015, and went on to win the Fishamble Award for Best New Writing. The 8 x10 min adaptation is told from Imo’s point of view, in the form of vlogs. Imo is played by Irish actor, Michelle Fox, whose credits include BBC drama Doctors and theatre work with the Bristol Old Vic Theatre, where she trained. Fox is joined by Aislin McGuckin (Paula, Outlander) who plays her mother and Emma Willis (The Young Offenders, Darkness on the Edge of Town ), cast as Tara, Imo’s younger sister. The series is produced by Kay Mellor’s Rollem Productions (Fat Friends, The Syndicate). All 8 episodes will be available as a box set on the BBC Three online platform. Independent Commissioning Editor for BBC Drama, Elizabeth Kilgarriff said: "Overshadowed is an incredibly exciting piece that showcases BBC Three's ambition to support young talent telling stories that matter. 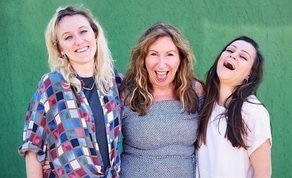 This is an important subject told from a compelling and unflinchingly honest perspective by the brilliant Eva and Hildegard and, with the support and experience of the wonderful Kay Mellor and Sian Palfrey, this is going to be a very special piece for the BBC Three audience." Eva O'Connor and Hildegard Ryan added "We are delighted to be working with Kay, her amazing team at Rollem Productions and BBC Three to bring this story, which is very close to our hearts, to life. We hope Overshadowed will be a fresh and innovative take on eating disorders and the way they can take over young people’s lives. We feel the YouTube style episodes are the perfect way to chart Imogene’s journey and capture the minds of young audiences." O'Connor and Ryan have been collaborating since 2010 with their writing theatre company, Sunday’s Child. Ryan directs their plays, while O’Connor performs on stage. With the support of Culture Ireland, their play ‘My Name Is Saoirse’ ran at the Adelaide Fringe in February 2017, winning an award for Best Theatre in the third week. Their interactive production ‘The Friday Night Effect’ debuted at the Edinburgh Fringe in 2017 and runs as part of the Dublin Fringe Fest from September 20th to September 23rd in Smock Alley Lane Theatre.